Cook the quinoa according to package directions. Remove from heat, let sit for 5 minutes, and fluff to cool. While the quinoa is cooking prepare the dressing by placing all ingredients in a blender. Pulse several seconds to blend. Remove and pour into a container. 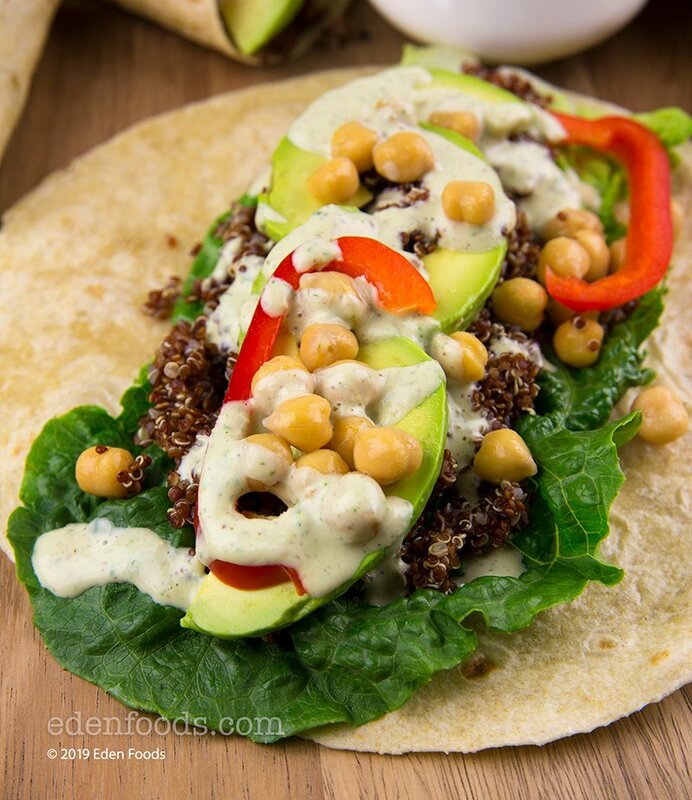 When the quinoa is cool, place a wrap on a flat surface. Place a lettuce leaf on the wrap and press down to flatten. Place 1/4 of the quinoa, garbanzos, avocado, almonds and minced onion on top of the lettuce. Then drizzle the dressing over. Roll up the wrap and slice in half. Repeat until all wraps are made. Place on a serving platter.